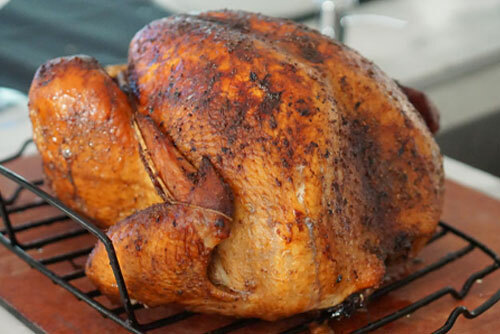 This can be prepared while the turkey is brining or a few days ahead. Mix together the ingredients and set aside in the fridge until ready to use. When ready to cook the turkey, soften this mixture to room temperature or microwave for 30 seconds until its very soft. Unwrap the turkey, remove the neck and giblets and rinse the turkey under cold water. Pat very dry. Fill a large pot with 2 L of water, and all of the brine ingredients (other than the turkey and mustard butter glaze). Bring the mixture to a boil, and then reduce the heat to medium low and simmer for about 10 minutes or until all of the sugar and salt has dissolved. Add in an additional 2 L of cold water and allow to cool to room temperature. Transfer to a bucket with a lid or a brining bag with the turkey in it, adding a bit of extra water if needed to cover the bird. Brine in the fridge for 1 hour per pound of turkey- so about 16 hours for this size bird. Remove the turkey from the brine, and discard the brine. Rinse the turkey under cold water and pat very dry. Tie the wings to the body of the turkey by tying a knot at the wing joint, hooking it around the wing and bringing it along the leg joint and then tying it to the drumstick. Ultimately, it doesn’t matter how you do this, I just like to get as little string on the turkey (so there aren’t big lines on the turkey) and just try to get those wings as close to the body as possible. Put ¼ cup of the glaze butter aside for the gravy. Rub the remaining butter up under the skin and all over the skin. Allow the turkey to sit and come to room temperature for about 40 minutes. While sitting, preheat the oven to 350 F and put the rack in the lower half of the oven. Place the turkey on a roasting rack in a roasting pan and set with a remote thermometer in the thickest part of the thigh. Cook for about 3 ½ – 4 hours, or about 15 minutes per pound of meat, until the thermometer reads 185 F in the thickest part of the thigh. Transfer to a cutting board and tent with foil for 30 minutes. While roasting, work on the roux. In a medium skillet over medium heat, melt the butter, then whisk in the flour. Reduce the heat to medium low and whisk until golden brown, about 2-3 minutes. Remove from the heat. Right before serving, bring the stock to a boil. Once the chicken is resting, set the roasting pan over a burner over high heat and scrape up the bottom of the pan to release any stuck on yummy bits. Transfer to a container and put in the freezer for 10 minutes until the fat separates on the top. Drain off the fat and then strain the remaining drippings. Whisk the drippings into the stock, then add in the roux and whisk until thickened. Add in the cream, and the reserved ¼ cup of mustard butter. Season with salt and pepper, to taste. Once rested, slice the turkey from the carcass and serve with the hot gravy.